Abuela Aminta looks out of her front door in El Amate. OK, so I know I said I’d post something the day after my previous post. That ain’t happen. Here’s what I’ve promised on the other side of today. In both El Salvador and the Dominican Republic, family is a force so integral to identity and survival that what the family wants and needs is essential to an individual’s wants and needs. Everyone takes care of everyone else. Everyone. 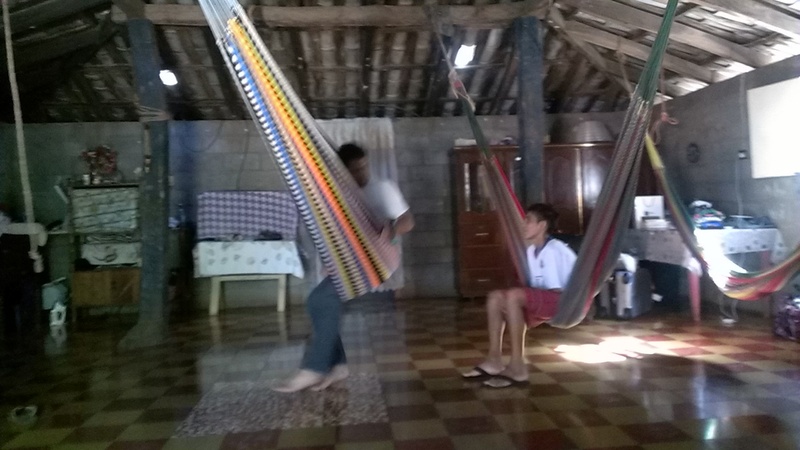 When we stayed with Kevin’s Abuela Aminta in El Amate, his tía Estella and prima Glenda cared for his grandmother. One of them was in the house on any given day, sweeping, mopping, cooking, washing clothes, shopping for food, shooing the dogs, chickens and cats away from something or out of something, watching novelas, the news, rearranging, ding something. Another family member took care of her cows, making sure they grazed in the mornings and received water before returning to the pen in the evening. In everything and everyone, there is such love in the act of caring among people. Kevin and his soon-to-be-cousin Kevin play in the living room/bedroom at Abuela Aminta’s house. The amaca took some getting used to, but once I took a shower and prayed for God to help me with the mosquitoes, I slept like a baby. El Amate is a small town, so in the nature of small towns, a lot more intimacy exists among people. In El Amate, people are closely related by blood or by marriage and neighbors operate like family members, often stopping by to sit and say hello or, in the case of Abuela’s neighbor across the street, dance. Every Sunday, the men and boys play a fútbol game against another team from another city or village in El Salvador. Though Kevin had not been in El Amate since Christmas, he stepped onto the cancha as if just last week he had played a game there, knowing who was on his team and who was not during a scrimmage game. The practices and games gathered themselves into an easy regimen. Wednesdays through Fridays are practice days in the afternoons when work is finished. Sunday afternoon is game day. When I spoke with Kevin’s uncle in Texas, who has not visited El Amate in at least five years, he said it was hard for him to be home because it makes him face his mother’s mortality, and perhaps his own. “If he comes home it will be a miracle,” Abuela Aminta shouted from her side of the room. We laughed, but her honesty presents the crux of the divide. She has changed. So has he. Change is as natural as time itself. But while he works in Texas and sends money home, his family in El Amate stays on this side missing him. Money is never a substitute for family — but it can help families obtain a higher quality of life: a nicer house, a car, or two, land purchases, electronics. On their Uncle Freddy’s sandia farm, Kevin’s cousin Nain prepares a bundle of sandia for a worker to carry down the hill. She’s small, but she can carry as many as four to six sandia at one time. Uncle Freddy stands on the left waiting for Nain to finish tightening the knot on the net. 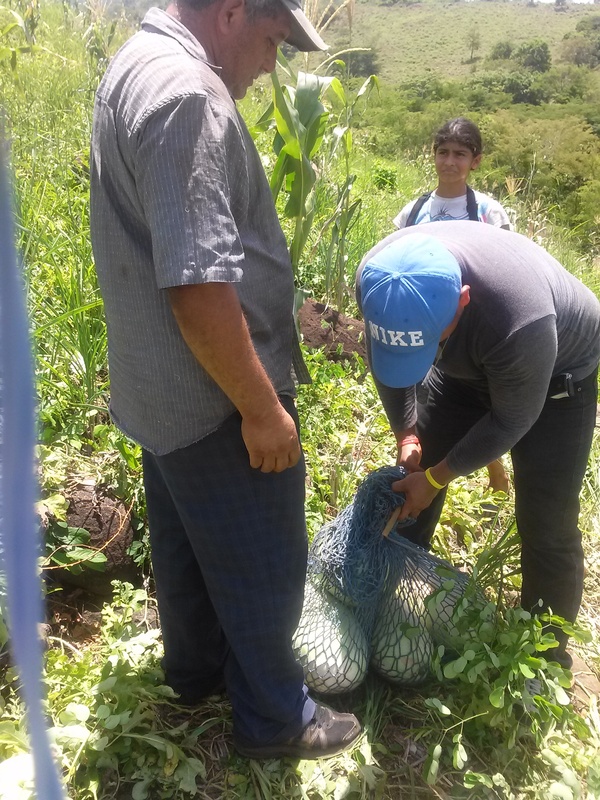 In El Amate, I hung out on a sandía (watermelon) farm for about an hour in the sweltering heat where several children and adults from El Amate were working for the better part of a day carrying watermelon up and down an incredibly steep hill. They were paid 10 cents for each watermelon they carried to the bottom. The highest paid worker that day — a man who could carry 11 watermelon at a time — made USD 7 dollars. And while that much money could feed a family, it does not compare to the daily wage that same man could make an average of $14.64 doing a hour’s worth of labor in the U.S. on a construction site or a little less than $10 an hour as a dishwasher reports the U.S. Bureau of Labor Statistics. And though the cost of living is higher in the U.S., money is often saved and sent home to finance the life you want to have when you return to the town and family left behind. According to the Pew Research Center, in 2013 El Salvador received $3.5 billion in remissions — financial assets sent from people in one country to people in another — from people, usually family members, living and working in the U.S. According to the U.S. Office of the Trade Representative, El Salvador exported about $2.4 billion worth of U.S. goods (t-shirts, coffee and sugar being the top products) to the U.S. in 2013. If I’m reading the numbers correctly, that means remissions dollars actually topped the goods value that El Salvador exported to the U.S. by more than $1 billion! But back to El Amate, where there are several people who move back and forth between borders with and without papers. But whether a person is documented or not, money is always a factor. It took money to get across and takes money to return to the family left behind, the same family who whose dreams are an immigrant’s own. ← what compels the journey?